Samsung, the popular Korean Smartphone manufacturer recently introduced a crystal version of the Samsung Galaxy S4 . The Crystal version of Samsung Galaxy S4 is made with Swarovski elements, the phone is actually the international version (I9500) of the flagship Android model and is powered with an Octa-Core Samsung Exynos 5 CPU. 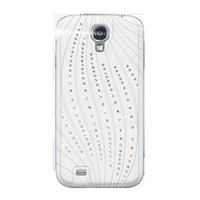 It is quite similar to the Samsung Galaxy Note 3 and the back is made of faux leather with embedded crystals. Only 3500 units of the Samsung Galaxy S4 Crystal Edition are being made available, and to buy one you have to visit a Samsung Store in Thailand because this version of the phone is made available by Samsung Thailand. The price of the phone is 20,300 baht ($634.17), while the regular Samsung Galaxy S4 is priced at 17,300 baht ($540.46), you can see the difference is just 3000 baht ($93.71). Its worth spending some extra cash on, right ? If you like something unique and highly-rated, then this crystal version of the Samsung Galaxy S4 will be the right shot for you. Better still, Are you the Gold type ? You can check some Hot Smartphones in pure gold here - HTC One Gold, iPhone 5S Gold, Samsung Galaxy S4 Gold, BlackBerry Porsche Gold and BlackBerry Q10 Gold . What do you think about the Samsung Galaxy S4 Crystal version ? Will you buy it because of the unique design or you still prefer the regular one to it ? Lets hear your thoughts.